Staybridge Suites Jackson Welcome to one of the top hotels in Jackson, Mississippi, a stately Southern belle steeped in tradition and history, swathed in culture and natural beauty. At Staybridge Suites Jackson, we are proud to call home the City with Soul, where hospitality isnt an industry, its a way of life. From world-class museums to the Freedom Trail, from jubilant festivals to spectacular parks, from award-winning attractions to vibrant live music, this is a city as thrilling as it is serene, as historic as it is contemporary. And our pet-friendly Ridgeland, MS hotel puts guests in the heart of it all. We're a short commute to area companies including IBM, Nissan North America, and Entergy Mississippi, yet close to scenic Natchez Trace and downtown Jackson. Here youll find the freedom to stay your own way in spacious guest rooms with separate living areas, fully-equipped kitchens, free Wi-Fi, flat-screen TVs, and roomy workspaces. You can exercise your cares away at our onsite fitness center and outdoor pool or handle last-minute work at our 24-hour Business Center, equipped with office supplies and printing services. On Tuesday-Thursday evenings, stop by our Social Reception and unwind with free apps and drinks. Our hotel in Ridgeland, MS is more than an extended-stay hotel; its a home-away-from-home where we treat you like family. McAlister's Deli: Gourmet Sandwiches, salads, soups and potatoes. Papitos: Serves Mexican food and drinks. Also has bar. Cracker Barrel Old Country Store: Old Country store that serves down home cooked food. 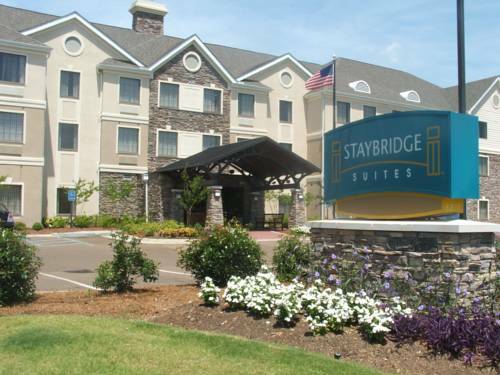 Childrens's program - Staybridge Suites Ridgeland MS currently has an outdoor pool for family fun. Meeting Room A: Our meeting room can seat 30pp classroom style. Please contact Patrice Benton for more details. The Renaissance MallThe Renaissance Mall is new to the area. Any and everything you can think of can be found at this mall. From great shopping to incredible restaurants. Le Fleurs Bluff Golf CourseThis course consists of rolling terrain, beautiful wildlife, and all the challenges every golfer desires. Each hole will test even the finest golfers around. With multiple sets of tees, the elevated tee shots are sure to make your round enjoyable. Sonny Guy Municipal Golf CourseThe 18-hole "Sonny Guy" course at the Sonny Guy Municipal Golf Course facility in Jackson, Mississippi features 6,835 yards of golf from the longest tees for a par of 72 . Jackson Zoological ParkI-55 South 220 South Exit 2, Capital Street (yield right) Travel approximately 2.5 miles Zoo on left.